Fashion buying, a key component in fashion retailing, is second only to design as a career option for fashion graduates. The buyer has a central role in influencing what consumers choose to wear and in determining whether a fashion retailing company succeeds or fails. Buying is a multi-faceted job, which typically involves fashion forecasting, range-planning, garment sourcing and budgeting. 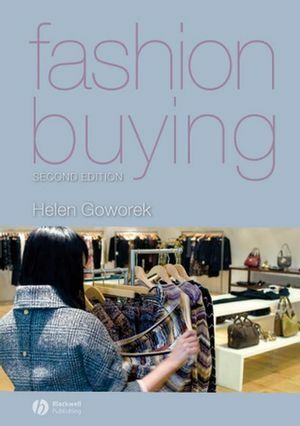 This comprehensive textbook describes the buying cycle, buying for stores and mail order and how to start a career in fashion buying. A glossary of buying terminology, as well as input from fashion buyers currently working for major companies, give a clear insight into this exciting and challenging role. The new edition has been revised throughout, includes more emphasis on buying for the internet, and all the interviews have been updated or replaced. Helen Goworek is senior lecturer in fashion buying, merchandising and product development at Nottingham Trent University. Her experience in industry includes having worked in both buying and design for several major UK fashion retailers. What do fashion buyers do?. 2 The Role of the Fashion Buyer . Qualities of a successful buyer. 3 The Buying Cycle . Review of current season’s sales and budget planning. Critical paths for product development, production and delivery. 4 Predicting Fashion Trends . Sources of fashion forecasting information. Classifying fashion merchandise within the range plan. Factors which affect the performance of a fashion range. Fabric dyeing, finishing and embellishment. Departments within a garment supplier. Case study in ethical garment sourcing. 8 Buying for Own Label Fashion Multiples . Case study in own label fashion buying. 9 Mail Order Fashion Buying . The mail order fashion market. Forecasting and assessing the sales performance. of a mail order range. Case studies in mail order fashion buying. 10 Buying Branded Fashion Merchandise . Budget planning and ordering merchandise. Selecting ranges of branded fashion merchandise. Processing orders and monitoring deliveries. Monitoring sales figures and reviewing the season’s performance. Case studies in buying branded fashion merchandise. 11 Fashion Marketing for Buyers . The fashion product life cycle. 12 Careers in Fashion Buying . Is fashion buying the right career for you?. Qualifications for a career in fashion buying. Relevant skills for fashion buyers. Career progression in fashion buying. Methods of finding jobs in fashion buying. Glossary of Fashion Buying Terms . * Case studies of fashion buyers currently working for major retailers provide an insight into the variety of responsibilities for buyers within different companies. The new edition has been revised throughout, iwith more emphasis on buying for the internet; all the interviews have been updated or replaced.